Marine House offers luxury seaside accommodation in a breathtakingly beautiful location on the south coast of England. You'll find we are uniquely situated directly on the seafront of the quintessential English village of Milford On Sea. Take a look at this aerial video to see the building and our stunning location for yourself! Stay with us and enjoy exceptional quality contemporary accommodation, uninterrupted sea views and a friendly, personal service. 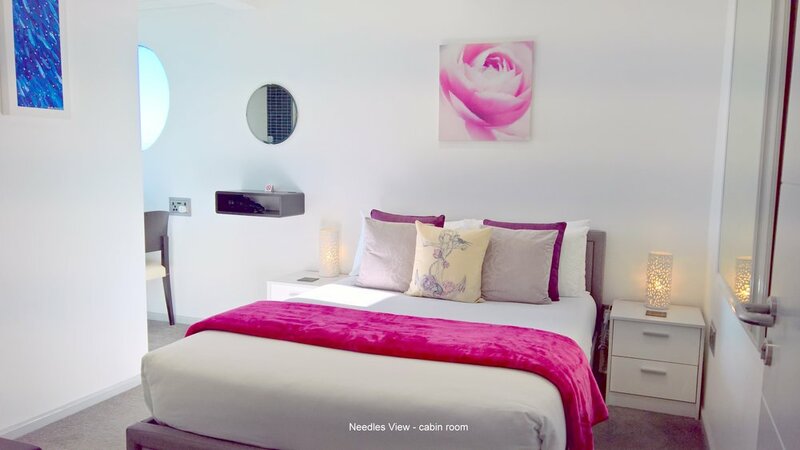 Our boutique B&B accommodation attracts rave reviews – click here to discover why for yourself. Use Marine House as your luxury base from which to explore the delights of the south coast and neighbouring New Forest National Park. Whether you join us for an overnight stay, a short or long weekend, or a week-long family holiday, we're confident that you won't want to leave! All Rooms and Suites have small tables and chairs, wide screen TVs, small fridges, with complimentary fresh milk, tea, coffee, hot chocolate, and bottled water. All en-suites have luxurious towels and robes for your comfort, as well as hair dryer and complimentary toiletries, for your convenience. 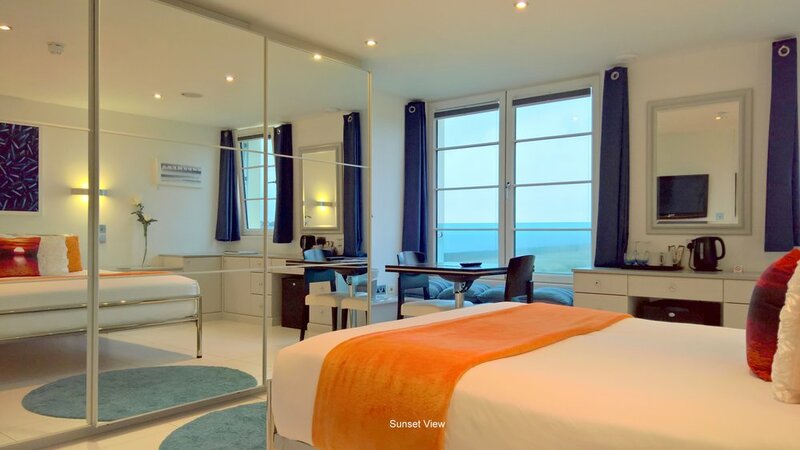 Situated on the front, south facing side, the Blue Horizon Penthouse Suite offers a totally unique, luxurious, seafront accommodation experience. Sunset View is one of three rooms which enjoy side sea views across Christchurch Bay and, often, dramatic evening sunsets. 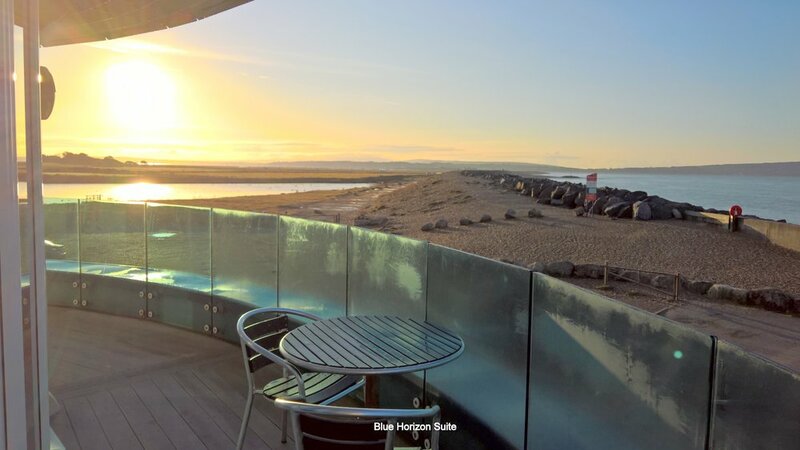 Situated on the east side of the building, the Hurst Castle Suite enjoys unrivalled views over Sturt Pond, Hurst Castle and the Isle of Wight. The second of our westerly-facing rooms, Christchurch Bay features twin beds or a super king-size with a luxurious shower en-suite. Our new Needles View cabin room contains a standard double bed with shower en-suite and is at the front of the building, offering sea views. The third westerly-facing room, Dolphin Bank features a king-size bed and generously proportioned shower en-suite.